Freedom of press: A guaranteed right? “Publicity is the soul of justice. Where there is no publicity, there is no justice.” The Constitution of India explicitly declares that all citizens shall have the right to freedom of speech and expression [Article 19(1)(a)]. The Supreme Court in Shreya Singhal v. State (2015) observed that there are three concepts which are fundamental in understanding the reach of this most basic of human rights which are discussion, advocacy and incitement. Mere discussion or even advocacy of a particular cause howsoever unpopular is at the heart of Article 19(1)(a). It is only when such discussion or advocacy reaches the level of incitement that Article 19(2) kicks in. It is at this stage that a law may be made curtailing the speech or expression that leads inexorably to or tends to cause public disorder or tends to cause or tends to affect the sovereignty & integrity of India, the security of the State, friendly relations with foreign States, and so on. 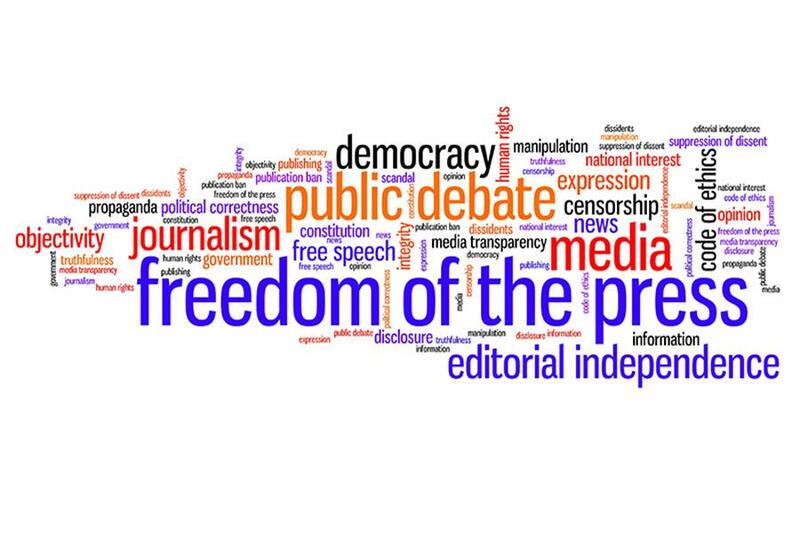 Way back in 1972 the Supreme Court in Bennett Coleman & Co. v. Union of India had held that although Article 19(1)(a) does not mention the freedom of the press, it is the settled law that freedom of speech and expression includes freedom of the press and circulation. It had earlier observed in Express Newspapers Ltd. v. Union of India (1958) that the Press has the right of free propagation and free circulation without any previous restraint on publication. Injunction and defamation suits are the common ways of censorship. The Courts have earlier observed that defences to an action for defamation can be compartmentalized in three compartments; truth, fair comment and privilege. Truth or justification, is a complete defence, the standard of proof of truth is not absolute but is limited to establishing that what was spoken was 'substantially correct' whereas fair comment offer protection for the expression of opinions. Standard of proof is not that the Court has to agree with the opinion but is limited to determine whether the views could honestly have been held by a fair-minded person on facts known at the time. But defence based on fair comment can be defeated if the plaintiff proves that the defamer acted with malice. Privilege is designed to protect expression made for the public good. Protection of qualified privilege is lost if malice is established. In public interest, absolute privilege is a complete defence. Absolute privilege being restricted to Court proceedings or proceedings before Tribunals which have all the trappings of a Civil Court and Parliamentary proceedings. Where truth, justification and fair comment are pleaded, there is to be no prior restraint on publication unless the court can find it to be a case of malafide. In the Caravan case (IIPM v. Delhi Press Patra Prakashan P. Ltd.) (2018) IIPM was aggrieved by an article titled “Sweet smell of success – How Arindam Chaudhuri made a fortune of the aspirations and insecurities of India’s middle classes” wherein expressions like “model school than a real one”, “the campus appeared sleepy” and “the scruffy management students” were used and it was alleged that it was a fit case for injunction. But the Delhi High Court held that prima facie the impugned portions were either based on the statements made by several persons or on facts available in public domain and/or were the author’s personal opinions and conclusions based on extensive research and report. The defendants had highlighted the evidence which was relevant and material on a matter of substantial importance and there was no material at that stage to conclude that the stories have been published by the defendants with a reckless disregard for truth or precipitated by actual malice or that the defence of justification/truthfulness/fair comment was one that could not succeed. The Delhi High Court in Dr.Shashi Tharoor v. Arnab Goswami & Anr. (2017) has held that one of the permissible heads of restrictions on freedom of expression is defamation and for a claim of defamation to succeed, a public figure has to prove additionally that the representation was precipitated by malice. Two-pronged test of necessity and proportionally have to be satisfied before ordering postponement of publication, namely, necessity to prevent real and substantial risk to fairness of trial and salutary effect of such an injunction outweighs deleterious effect to the free expression. Courts are also reluctant to grant temporary injunctions as section 38 of the Specific Relief Act states that while granting temporary injunction if there is a method of quantifying damages which a person may suffer because of non-grant of such an injunction then injunction ought not to be granted. Thus in Naveen Jindal v. Zee Media (2014) the High Court observed that money can be adequate compensation in such circumstances and the injunction should not be granted. The courts are not at all powerless to postpone reporting in exceptional cases. In Sahara India Real Estate Corporation Ltd. v. SEBI (2012) a Constitution Bench of the Supreme Court has held that there is power in the Court to postpone reporting of judicial proceedings in the interest of administration of justice. Also, presumption of innocence and a fair trial are at the heart of criminal jurisprudence and in a way important facets of democratic polity that is governed by rule of law. In Naveen Jindal v. Zee Media Corporation Ltd (2015) the Delhi High Court has held that the power of the High Court to order restrain of publication in the media would clearly encompass the stage when the criminal case against the accused is at the preliminary enquiry or investigation stage. Here injunction was granted as investigation was sought to be influenced inasmuch as the Investigating Officer was sought to be interrogated/interviewed on Television. Swatanter Kumar v. The Indian Express Ltd (2014) is a case in which a pre-publication restraint order was passed against reporting the name or photograph and without giving his side of the story. Distinguishing the case, the High Court in a later case (Naveen Jindal vs. Zee Media Corporation Limited (2014)) observed that in Swatanter Kumar case the plaintiff was a former Judge of the Supreme Court and by virtue of his holding of a past office he was under an obligation not to have publicly refuted the allegations made against him. But in Naveen Jindal case the plaintiff was a MP on two occasions and he had ample opportunity to address the public, hold a press conference and give his side of the story. In reporting ongoing cases, courts now insist on a disclaimer that the matter is still subjudice or final decision in the case is still awaited. In the R.K. Pachauri sexual harassment case, the court had earlier ordered that any telecasting of interview or coverage or reporting or comment should include a subtitle “in any court the allegations have not been proved and they may not be correct”. The title had to be in bold letters and similar in font and the manner as the channel informed about breaking news. In print media it was ordered to be in middle of the page in bold letters and five times larger than the font in which the article was being published. But now the court has done away with these stipulations while vacating its earlier order holding that such restrictions are not valid. Instead consideration of the views/comments of the plaintiff or his authorised representative should be taken and if such views or comments are not given by them then a statement as to the fact that an effort was made to ascertain their views should also be made in the news. Also, a sentence “that the matter is still subjudice or the matter is still pending in the Court or final decision in the case is still awaited” should be aired. In relation to political censorship, the Madras High Court once observed that in a free democratic society those who hold office in government and who are responsible for public administration must always be open to criticism. Any attempt to stifle or fetter such criticism amounts to political censorship of the most insidious and objectionable kind. Lord Denning had rightly observed that the interest of the public in knowing the truth outweighs the interest of a plaintiff in maintaining his reputation.